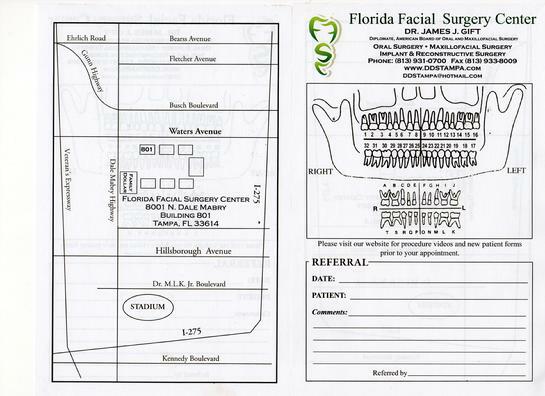 Click the image below to print our referral for Dr. James Gift, Oral Surgeon Tampa, FL. If you need referrals sent to you please contact our office via telephone or email at ddstampa@ddstampa.com. Our online forms are in PDF format to allow patients the convenience of printing and completing their health history and registration forms from home or work. Please download the free Adobe Acrobat Reader plugin from Adobe’s web site, if it is not already installed on your system. It is important that you have at least version 5 of the plugin, in order to successfully use our forms.